Oh London, aren’t we in a limbo? I don’t know about you non-Londoners but here in the Capital we’ve been enjoying beautiful, sunbathing-worthy 25 degrees, before it plummets to below 10 degrees the very next day. Deciding what to wear each day can be a bit of a puzzle, and I don’t know about you, but I already shuffled my winter coats to the back of my wardrobe ready to pack them down for the Summer. One day you’re bundled up in knits, and the next, sandals and skirts are all you need. In my eyes, and as a Londoner for almost 6 years now, the answer is always a fabulous Trench coat. Layering up this light outerwear piece always looks chic, and it gives you extra protection from the chill on those cooler days. 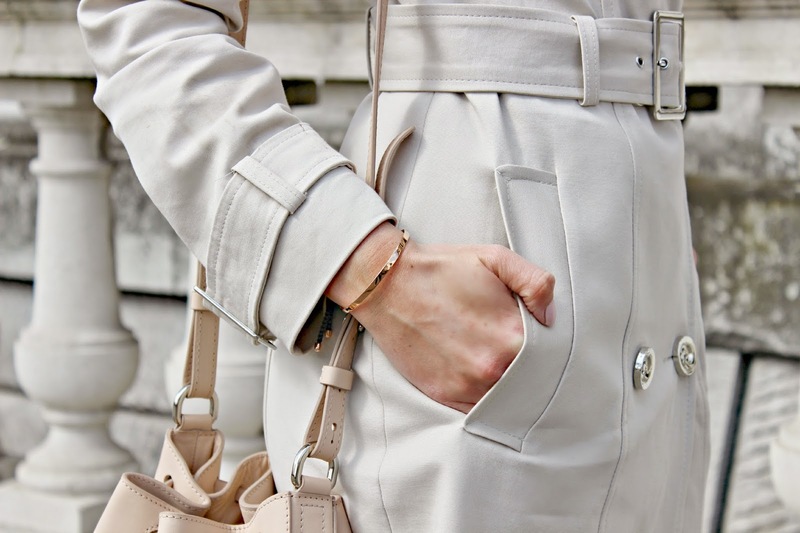 I’ve been layering my trench (which looks far more expensive that it is!) over a very simple grey camisole top which is super for catching the sun when those rays do come out, and a pair of classic white jeans. White denim has to be the perfect Spring wardrobe transition piece. Pastel accessories add that compulsory pretty shade to the look, so I’ve matched my sunglasses, bag and block mule heels in a soft pastel pink shade. Scroll down for more details and links! Oh and that gorgeous watch? It’s Daniel Wellington (but you already knew that!) and if you love it, you can choose any watch from the website and get 15% off with the code FashionMumblr. These beautiful mules are only £39 from Miss Selfridge! How have you been dressing in this ever-changing weather?